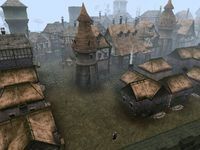 Old Ebonheart is the largest Imperial city in Morrowind, as well as the province's Imperial capital. Set on the eastern banks of the Thirr River delta, it is built on the ruins of the original city of Ebonheart, which House Indoril chose to burn to the ground rather than surrender to the Empire during Tiber Septim's campaign. 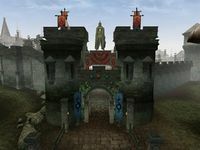 The city was rebuilt in the Colovian style and a great citadel, the Ebon Tower, was constructed to control the route between Vivec and Almalexia. Across the bridge from the plaza is the Ebon Tower. This massive structure contains a courtroom, offices, living quarters for many notable people, the Morrowind Imperial Legion Headquarters, a large atrium, provincial missions, and more. The court wizard, Tarhiel, has recently vanished from his chambers. 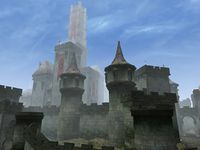 The six dukes of Morrowind occasionally call the castle home, although the Duke of Deshaan is the only one currently in residence. Lord General Caecalia Victrix is the head of the Imperial Legion in Morrowind, and lives within the headquarters. The plaza, west of the main gates, is home to several manors and offices. The Fighter's Guild, Imperial Archaeological Society headquarters, East Empire Company offices, Grand Chapel of Talos, and other important buildings are located here. Traveling vendors sell their goods by the fountain. To the east of the main gates is the market district, which provides dozens of services to the player in its many shops. Alchemists, clothiers, enchanters, armorers, booksellers, bakers, and other traders offer their goods to resting travelers. Some inns will accommodate the player, and the local Mages Guild is to the west. 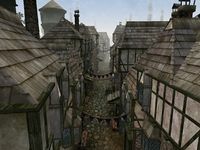 On the far eastern side of Old Ebonheart lies the slums, which stretches over the market and to the west, eventually ending with upper-class households in its place. Besides Gul Ei's pantry, Arnulf's smithy, and a few taverns, such as The Salty Futtocks and The Empress Katariah, there is little of interest here. North of the slums lies the docks. Merchants and sailors flock here to rest and sell items not normally sold in Dunmer cities. 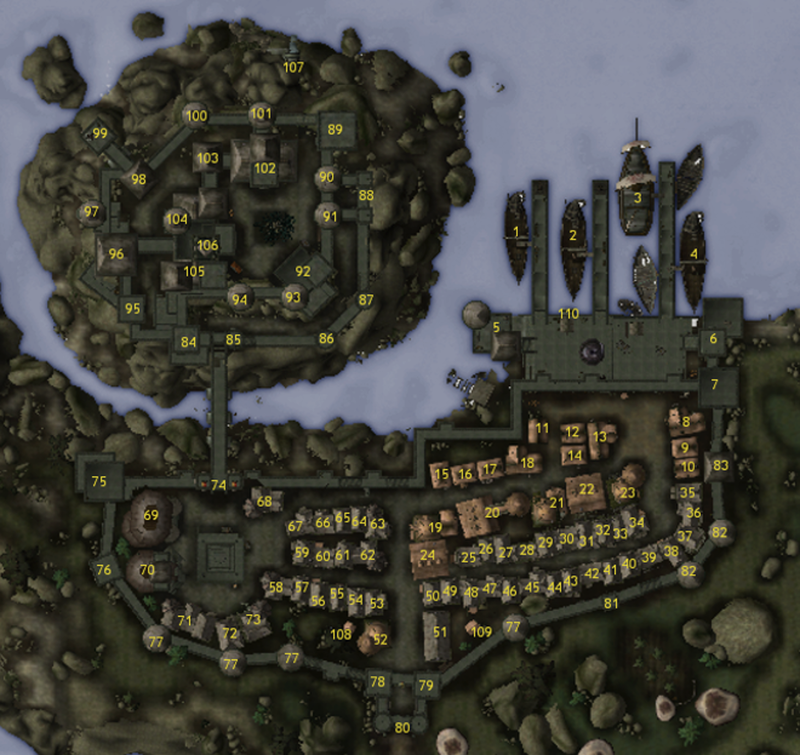 The Imperial Navy Headquarters, a Census and Excise office, an Imperial Navy warship, and other anchored ships currently call the Old Ebonheart docks home. With the exception of the Imperial Proconsul, who is in Narsis, the most important figures of the Imperial government in Morrowind reside in the Ebon Tower. This includes Imperial nobility, military officers and members of the Imperial Curia. Lord Caros Cocceius, Burgrave of Old Ebonheart and Castellan of the Ebon Tower, can be found in the Ebon Tower Palace. He both governs the city of Old Ebonheart and manages the Palace household, which nominally belongs to King Helseth. Duke Phyrios Mattimus of Deshaan is also staying in the Palace's High Chambers as a long-term guest -- far from the troubles of his unruly Duchy in the south. Provincial ministers, high-ranking nobles of merit, can be found in the Curia building. Lord General Caecalia Victrix of the Imperial Legion resides in the upper most floor of the Legion headquarters. See also People in the Ebon Tower. Outside of politics, other notable figures are the Imperial Cult Primate Strixus Sorvilius in the Grand Chapel of Talos, and Merxia Vendicci, the director of the East Empire Company, in her manor. The local Mages Guild chapter is led by Arquebald Vene, and the acting steward for the Grandmaster of the Fighters Guild is Sharnoga gra-Mal. The Empress Katariah inn is a den of Thieves Guild activity with the eccentric Cap'n Fentus acting as the ringleader. Decimia Gastoit is the dean of the Archaeological Society. For a complete list of all the people in Old Ebonheart, go here. A fast and easy way to reach Old Ebonheart is by boat. Routes will take you to the docks from Helnim through the village of Ildrim, with the travels plugin from Ebonheart, and in the future from Andothren and Almas Thirr (not currently released). The local Mages Guild can provide a Guild Guide for more locations. The Temple of the Nine Divines is reachable by Divine Intervention. By foot, Old Ebonheart can be reached with relative ease by taking the paths running in the region through Dondril and Vhul on the way from the crossing at Almas Thirr. Serynthul, to the east of the city, is a Tribunal Temple infirmary commonly visited for healing purposes. Dondril, a farming community with few services, is south of the city. Vhul, a velothi village south of Old Ebonheart, contains a Tribunal Temple, a notorious tong, and several services for the player. The Hlaalu shack village of Gol Mok (not currently released) lies just across the delta. Belated Justice: General Casik has been languishing in a dungeon for three decades. He still insists that he is innocent. An Archer's Potential: Impress a master archer. Kneading The Dough: Collect dues for the Bakers Guild. A Small Complaint: Another day in The Salty Futtocks, another dead body. Sticky Situation: Help Eulix Festius build a new mortar. The Sorceror's Apprentices: Help choose a new master sorceror for Ebon Tower. Tamriel Rebuilt: Help Docelle Bien finish her Tamriel Map and learn the plight of a TR modder. Where is the Horse Gone? This page was last modified on 6 March 2019, at 08:38.